WE’RE ON A TRAIN! 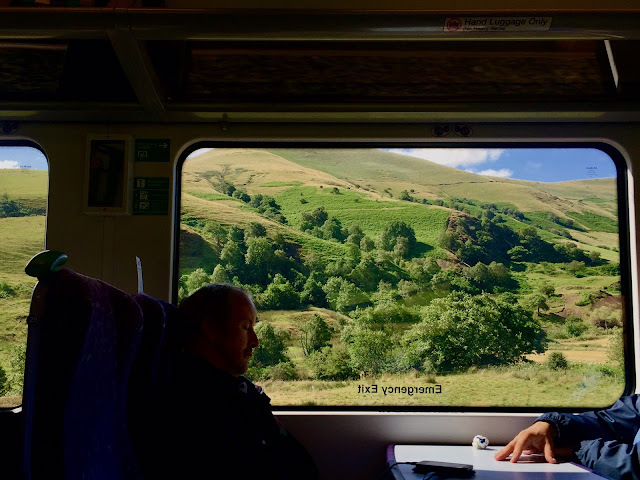 I have exactly forty minutes until our next destination – Sheffieeeeld – where we’ll be dropping our bags at the hotel before sprinting straight to the Peak District and Chatsworth House. There we expect to see some fine Mitford fashion and perhaps have a tea (I’m not going to have a tea). The sun has come out and the promises are high! Then tonight – after exhausting ourselves on the thrilling joyride of Regency hemlines – we are going to a friend’s bottle shop and playing cards. I’m feeling particularly well-equipped for gaming after getting stomped by Hannah at Scrabble last night. There’s nothing I can’t lose at now! Look at the view from the train! No, YOU sat on the wrong side. Shut up. WHOA! Fast train was fast; we're pulling in to Sheffield now. See you tomorrow for Adventures in Barnard Castle!